Buy Online Now! 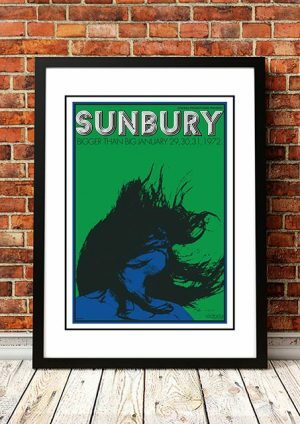 – Blackfeather Rock Concert Posters and Memorabilia. Blackfeather are an Australian rock group which formed in April 1970. The band has had numerous line-ups, mostly fronted by founding lead singer, Neale Johns. An early heavy rock version recorded their debut album, At the Mountains of Madness (April 1971), which peaked at number seven on the Go-Set Top 20 Albums chart. It provided the single, “Seasons of Change” (May 1971), which was co-written by Johns with lead guitarist, John Robinson. In July 1972, a piano-based line-up led by Johns issued an Australian number-one single, “Boppin’ the Blues”, which is a cover version of the Carl Perkins’ 1956 single. We stock a couple of Sunbury Music Festival Posters in which Blackfeather appeared from 1972 to 1974.